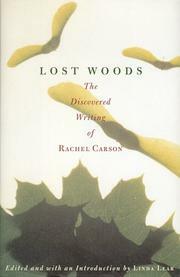 Biographer Lear (Rachel Carson: Witness for Nature, 1997) knits together here a number of Rachel Carson’s writings—often much more personal, quirky, and searching than her celebrated books—that add meat to her body of literary/scientific writing. Carson published just four books during her lifetime, but she also cranked out speeches and articles and newspaper work, kept copious field notes, and wrote thousands of letters. Lear has selected from this material a chronological sampling as a guide to Carson’s evolution as a writer and a natural scientist. Many of the pieces will be new to most readers, even if their tone—of “awakening an emotional response to nature”—is trademark Carson. This collection includes pieces on Carson the hard-core birder: there are both field jottings and essays on chimney swifts and warblers and gulls, and a rapt couple of days on a hawk watch in Pennsylvania. She wrote liner notes to Debussy’s La Mer, music which she comfortably interprets to jibe with her notion of the ocean’s mysteries. She was certainly one of the first to give the importance of island biogeography more than a passing nod; an essay on the destruction of rare island habitats, and the extinction of island species, has been included by Lear. And her anxiety over atomic weapons, especially when byproducts are dumped in the oceans, is spelled out here in her preface to the second edition of The Sea Around Us. As always, touching all aspects of her work are her puzzlings over the simple fact of life and her druidic appreciation of natural cycles and the beauty, excitement, and inscrutable elements of the natural world. Carson devotees will already be familiar with some of this material; the more casual (if no less admiring) fan will find in this collection an engaging glimpse into the breadth of Carson’s curiosity and the fashioning of her public voice as a defender of the environment.